Oksana has been working hard on completing her Presto Nine Patch quilt. She put in a lot of extra work to make it a larger size and has been diligently coming by the shop to complete her machine quilting. 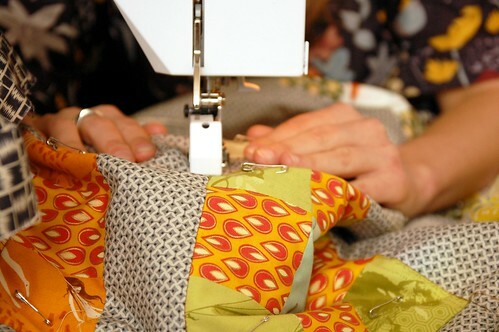 She’s now finishing off the quilt with some hand quilting and I’m looking forward to seeing the quilt completed! I’m really sorry to hear about your camera being stolen. I’ve had that too with a camera I absolutely loved. Last year I got the Nikon D60 and as far as I’m concerned it has done an excellent job so far.